Fishing has been considered as a popular recreational activity for a long time. Nowadays, people catch the fishes only for fun, for competition as well as for food. A number of techniques and devices are there should be chosen according to one’s needs and preference while fishing. Fishing reel is a vital item that needs to be selected carefully. Because a right reel can give you a right chance to catch the right amount of fish without wasting much time. But problems arise when the questions of the left-handed peoples come. They naturally face a great extent of difficulties with the usual reels designed as the right-handed versions. Considering them Shimano Torium 16 HG reel is here that comes with both left and right handed versions and suitable for saltwater fishing. Have a broader look in our Shimano Torium SW Saltwater stardrag mulitplier reel review to get more knowledge about this. Torium 16 has an excellent Gear ratio of 6.2:1 that ensures a good casting. The large main gear allows a Staggering line retrieve of 117cm per crank of the handle. Torium 16 has a Narrow spool that greatly reduces the requirement of guiding the line manually. Besides, it makes the reel much lighter and well balanced on the rod’s tip. Of course, it is an impressive feature. Three SA-RB bearings and one roller bearing are made of stainless steel. These will give you a silky smooth performance. Ball bearing ensures smooth and accurate performance preventing the spool’s backward movement. The Cross Carbon star drag system inside the Torium 16 is a multi-waster star drag that uses Dartainium washers. These high-performance washers allow for very smooth and high speed runs from oceanic fish. There is also a nice ‘Click’ feature to it as adjustments are made. Lightweight and ergonomically designed Torium gives easy and long casting sessions efficiently without fatigue. Fish of 15 to 20 lbs can easily be caught but above 20 lbs it is difficult to stop them with drag on. Q: Does this reel have centrifugal brakes? A: The model Torium HG 30 had centrifugal casting brake and termed as VBS by Shimano. But where there is no other braking type feature except the right side cap of the pinion bearing, you can protect your thumb and use it as the brake to control line. Q: Where are the reels made from? A: These reels are made in the Shimano factory in Malaysia. Q: Is long cast possible with this reel? A: Yes, no problem. With a little practice, you can also throw heavier lures very well. It will turn an average caster into a good caster; this reel is magic! From ages, Shimano Torium Series reels have been catching big fish. Now the left-handed version has added an extra dimension to their Torium Overhead collection. Speaking of collection, why not check out our pick for the best spinning reels. Beefy star drag reel Torium has become a great choice for jigging or bottom fishing. Shimano Torium SW left-handed version TOR16HG is a great blend of power and speed. It will ensure you to get full satisfaction against their price. Metal ball bearings, high gear ratio, powerful drag system and other fabulous features will relief all left-handed fishermen from worries. It is definitely a solid choice for them. So, whether you are a lefty or righty, don’t be frustrated. 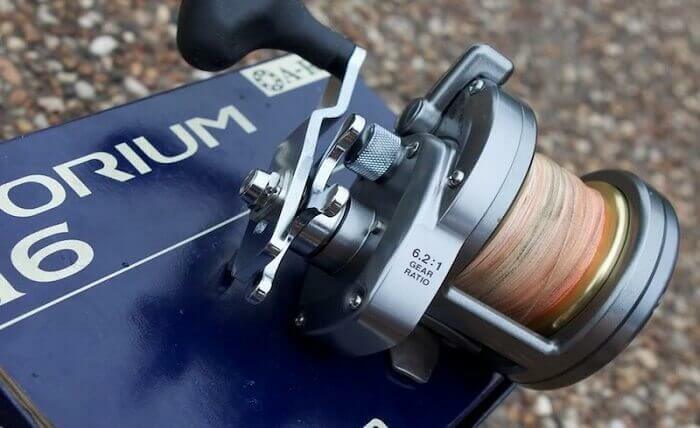 Take your Shimano Torium 16 HG SW Left and Right Handed Version reel and go out. Catch an abundant of fish until you boat is full. It is the time to rock the ocean.